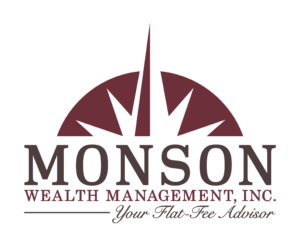 Services – Monson Wealth Management Inc.
We know you expect sound advice and professional service. You want a good return on your investments, without spending more than you have to. We follow a proven model to make sure you are getting all of the services you need and advice is being given with your whole picture in mind. As a Fiduciary, we have a commitment to doing what is in your best interest. 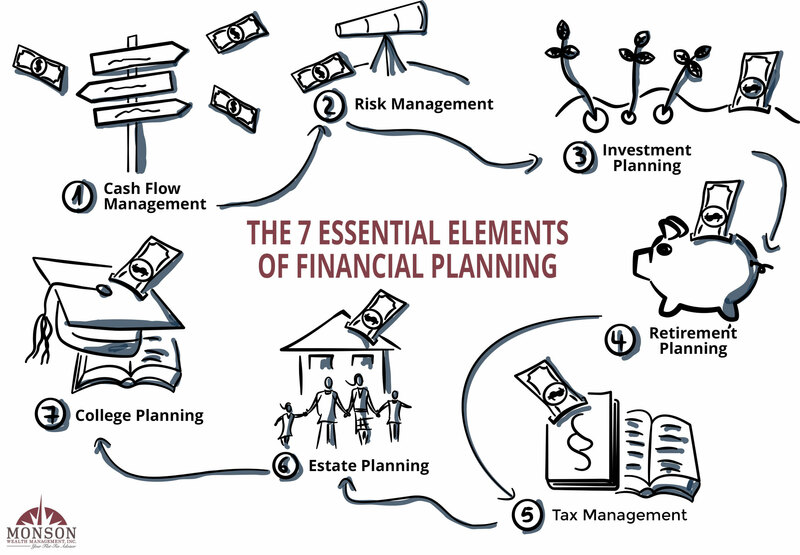 We focus on the 7 Essential Elements of Financial Planning to make sure all bases are covered. Cash flow is not just budgeting. It is intentionally managing income, savings, and expenses to make sure you are meeting your savings goals, obligations and that your cash flow behavior matches your priorities. Risk Management is where we analyze strengths, weaknesses, opportunities, and threats in your financial health. It's also being honest about your comfort level in relation to investment risk and allocation. We want to make sure there is a plan in place to mitigate those risks and a plan in place to ensure that life events don’t derail long term financial goals. Investment Planning involves selecting the best investment mix to fit your long term goals, comfort level and probability for success all while exercising best practices when it comes to such things as rebalancing, tax loss harvesting, cost-effective investment options, etc. Retirement Planning is a process that involves foresight and commitment. We act as a guide for you to help ensure you are ready to retire on your terms. And once in retirement, we walk alongside you, adjusting things as needed to ensure you to have a successful and enjoyable retirement. Tax Management is important because taxes affect every aspect of your financial plan. While we are not accountants, we do help ensure decisions are made with an understanding of the tax consequences and doing our best to minimize tax liability while still reaching your financial goals and objectives. Estate Planning is about making sure your post death wishes are going to be able to be carried out in the most kind, straightforward and family-friendly way possible. We guide you through the organization and preparation to be ready for unforeseen circumstances that can often come up later in life. If estate taxes are a potential threat for your heirs, we can help put plans in place to minimize them as much as possible. College Planning is a gift many parents and grandparents want to provide for their favorite young people. We enjoy helping you do that by working through the college planning process by providing cost-effective ways to invest and pay for school.